“My son, do not regard lightly the discipline of the Lord, nor be weary when reproved by him. For the Lord disciplines the one he loves, and chastises every son whom he receives” (Heb. 12:5b–6). It is clear that one problem the original audience of the epistle to the Hebrews faced was that they were looking at their circumstances without looking to God. The exhortations to look to Jesus and to consider His trials (12:1–4) demonstrate that this audience was consumed with pain and not with the One sovereign over all things, including their pain. This was what was causing them to stumble. Today’s passage supports this understanding of their situation. In 12:5–6, the author reminds his audience that God disciplines His children. Had they fixed their eyes on Jesus and studied the Scriptures, they would have had a correct understanding of their situation. They would have seen that their sufferings were to be expected. They would have seen that God sometimes uses them in order to discipline those whom He loves. Such sufferings demonstrate that God loved them and desired to bring them into a closer and holier relationship with Him. Thus, they would have accepted these sufferings and endured them with confidence rather than considering a return to the old covenant. Had they been looking to their Father and the purpose He had in their suffering, they would not have been so quick to question their commitment to Christ. The idea that God may discipline us, and that He may use suffering to do so, is hard for us to understand. We do not like to think that God can be displeased with us on occasion. Furthermore, the popular but incomplete understanding of the love of God that influences our culture makes it hard to see how God can both love us and allow hardship to come into our lives. We shall discuss the idea of discipline and suffering more over the next few days. At this point we shall note two very important things. First, though God may allow evil to come against us, He is in no way responsible or culpable for it (James 1:13–14). He may allow suffering to discipline us but He never authors evil Himself. This is mysterious, but we must affirm it because the Bible teaches it. Secondly, we must remember that God disciplines us because He loves us (Heb. 12:6). 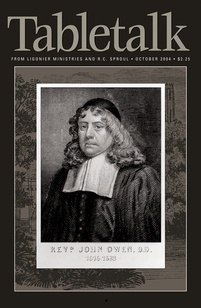 John Owen says that love precedes discipline. And because love comes first, it will remain even when, in heaven, we will no longer need to be disciplined. Some, but not all, suffering in our lives occurs because God is displeased with us. If you are having to endure a period of suffering, ask yourself whether God might be disciplining you for sin. If so, repent of your sin and remember that God disciplines you because He loves you.